Turns out there's no need to wait for Black Friday to find a great deal on a PS4 bundle. One thing you learn quickly as a Slickdealer is that there are great deals to be had throughout the year on many sought-after items. Our users are very crafty and often go to great lengths to find different offer combinations that create incredibly slick deals. Take PlayStation 4 bundles, for example. Most people think Black Friday and Cyber Monday are the only times you'll see truly great deals for that console, but there was actually a sub $300 deal for it in May of last year. 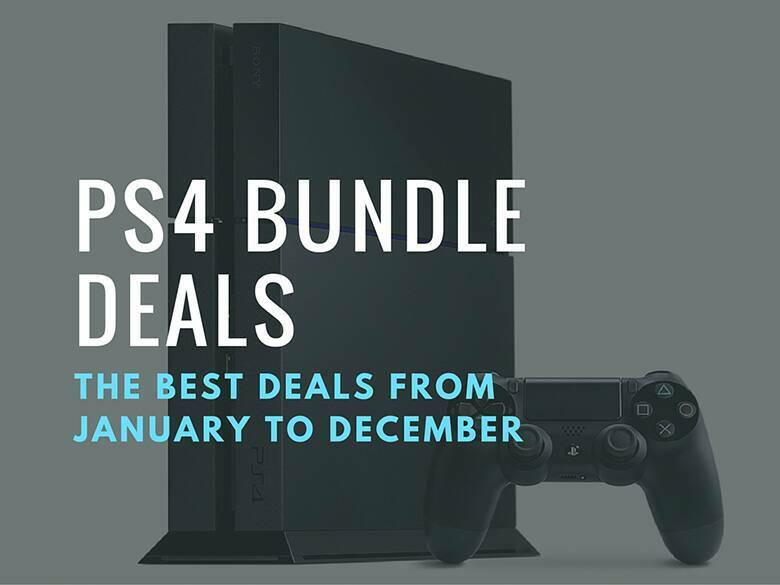 After looking at all of our Popular and Frontpage deals for PS4 bundles in 2015, we decided to map them out and find out how the deals were structured. Some were more straightforward than others, but a few required some effort or luck (sometimes both). The lowest price was in December, when you could get the "Uncharted" bundle for $237 from Jet.com. The deal combined a 20% off Jet.com coupon and a $20 off $50 offer from American Express. That's a great deal, despite most places having already lowered the retail price to $299 for PS4 and Xbox One bundles in late November. Something that was a bit surprising was that we didn't see a single deal worth mentioning in September, but that was most likely due to the fact that there was a planned price drop happening in October. Over the course of the year, there were 41 PS4 bundle deals that made it to the Slickdeals Frontpage. An additional 46 made it to the Popular Deals forum, so there was definitely not a lack of bargains out there. Prices had to include shipping but exclude tax. Prices were out of pocket costs; cash back or gift cards did not count. Must be a Frontpage or Popular deal. Deals could only be for new standard 500GB bundles, no refurbished units. Sales tax varies by state and some merchants don't charge sales tax at all for certain states, that's why we used pre-tax prices. Factoring in gift cards or cash back bonuses into a deal price is pretty common Slickdeals logic, but we decided to exclude those because it wouldn't be an even comparison. The one exception to this rule was a deal that had an instant statement credit through American Express. An abbreviation you'll often see on Slickdeals is "YMMV" which stands for "Your Mileage May Vary," meaning everyone might not be able to take advantage of that deal. There were a few of those types of deals for PS4 bundles last year that we excluded for that very reason. In March, May and June, for example, you could get $175 in trade-in credit for a PS3 Slim or Xbox 360 at Best buy and GameStop. 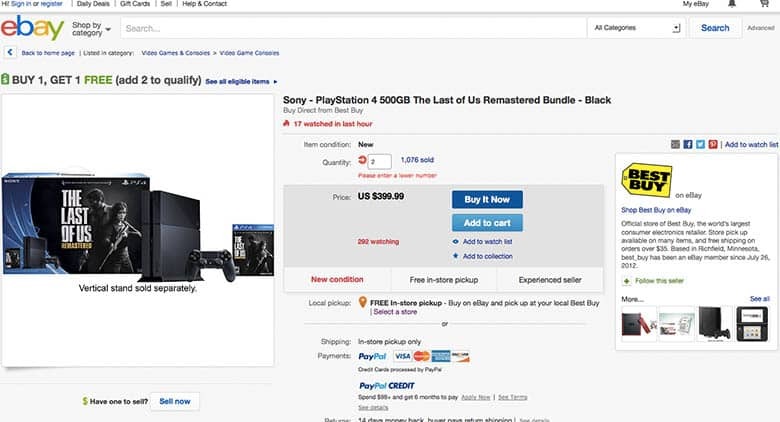 The full price for a PlayStation 4 bundle at the time was $399, so the people who had a qualified console to trade in could have gotten a new bundle for $224 plus tax. That's huge savings, but we didn't include it on our list since it wasn't available to people who didn't have a PS3 Slim. Another great deal was a Buy One Get One deal for $399 at Best Buy via eBay. It was a price mistake, however, so it didn't last very long and the lucky few who got their hands on it had to opt for in-store pick-up. People who selected delivery got their orders canceled pretty quick. 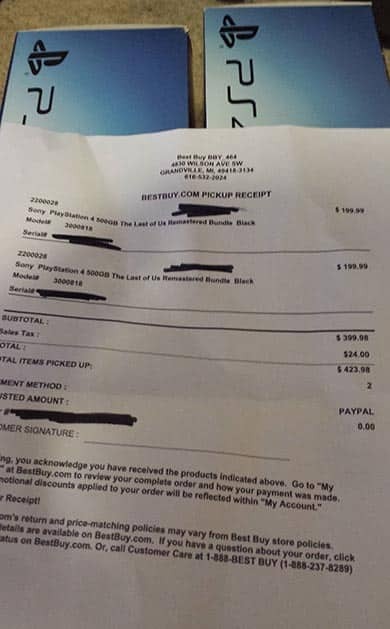 This deal was excluded from our list because a) You still had to pay $400 out of pocket, and b) it was only live for a short period of time before Best Buy fixed the error. The anatomy of a great deal can be as unique as a person's DNA. We all know to look for coupon codes when we shop online, but that's barely scratching the surface. The best PS4 deals from last year took advantage of several different discount opportunities, such as discounted gift cards, Cartwheel app offers from Target, wedding/baby registry discounts, seasonal offers (think tax season), paying with VISA Checkout and first-time customer offers. Very few of these are exclusive to PS4 bundles, which goes to show you that being creative is a requirement for finding a great PS4 deal. Then again, you can always leave that to other people by just setting up a Deal Alert and waiting for your notification. The retail price for a PS4 bundle for most of 2015 was $399, but it was lowered to $349 in October and then temporarily lowered to $299 during the holiday shopping season until mid December. So even though some of the best deals could be found in November and December, the actual discount amount wasn't as high as it was in May or August. Clip a $15 off coupon for each account. Coupon is for buying two $25 Groupon gift cards (2 x $25 GC = $50, but you pay $35). Go to a Kroger store and buy seven 2 x $25 Groupon gift cards, all as separate transactions using all of the seven club accounts you set up. You end up paying $245 for $350 in Groupon GCs. Take advantage of the Groupon deal for a PS4 bundle, which was $379.99, and pay using your gift cards, plus another $29.99. Groupon was surprisingly the place to go if you wanted a great deal on a PS4 bundle last year. From March through June, Groupon had the best deal each month. Target, eBay and Newegg all had "deal of the month" twice and Jet.com finished off the year with the lowest price of 2015 in December. It was a bit surprising not to find Best Buy in the list, as we frequently see their video game deals on the Frontpage. Although if you count the trade-in credit deals, they technically had the lowest price of the year.